Join us at the opening reception on 2/1 for free wine and beer, with the artist in attendance - RSVP here! The Made in NY Media Center is excited to present Crap: A Beeple Retrospective, compiling the works of Mike Winkelmann. Over the last decade and a half, Mike Winkelmann’s evolution as an artist has been on full display in a way that few other artists have ever attempted, nor is it something they’d likely ever see as desirable. But Beeple, as he’s come to be known, embraces public interaction. In an era where artists, writers, and musicians are constantly bickering over potential intellectual property infringements, few are willing to give their work away for free. Not only does Beeple give much of his work away for free, he doesn’t stop there – he goes further, making his working Cinema 4D files available for anyone to download, altar, and render out a new, unique version. As his themes have moved from pure abstraction into life-like science fiction, Beeple’s work has grown increasingly complex and yet he still manages to maintain a very organic quality in even the most mechanical of imagined landscapes. This signature tone makes his work instantly recognizable and sets him apart from so many other artists. Each twenty-second loop is a window into another world, frequently with different laws of physics, different color palettes, and populated by different forms of life that traditional science could have never imagined. These conjured worlds move from abstract and colorful to mechanized hellscapes, but there’s always artistry and organic beauty on full display, imbuing each clip with a lived-in quality that sparks the imagination like few others out there today. For the last ten years, Beeple has created one new image each day and was recently featured on art websites from around the world. This inability to pause and become complacent is undoubtedly an overarching factor in the self-taught artist’s seemingly unending advancement of his technical skills and the thought process guiding him. 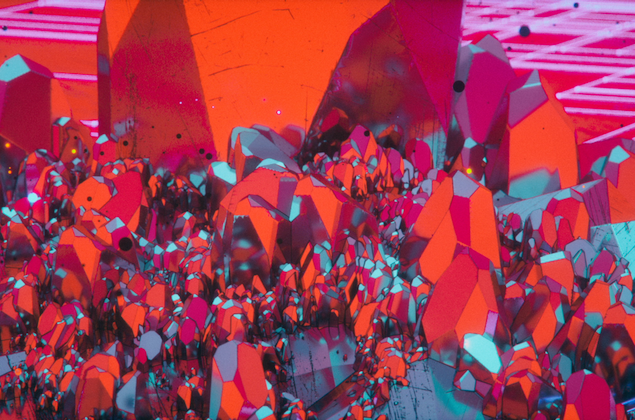 The Made in NY Media Center by IFP is proud to exhibit more than 60 videos that Beeple has created over the last decade, ranging from VJ clips to short films to music videos. A graphic designer from Appleton, Wisconsin, USA, his short films have screened at onedotzero, Prix Ars Electronica, the Sydney Biennale, Ann Arbor Film Festival and many others. He has also released a series of Creative Commons live visuals that have been used by electronic acts such as deadmau5, Skrillex, Avicii, Zedd, Taio Cruz, Tiësto, Amon Tobin, Wolfgang Gartner, Flying Lotus, and many others. He currently releases work on Flying Lotus' Brainfeeder imprint.